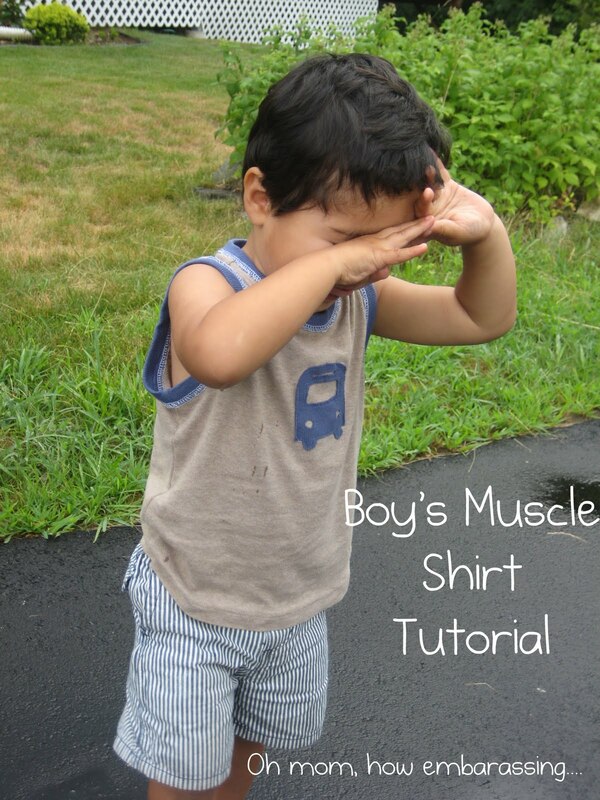 Last summer, I put together one of my first tutorials for a boy's muscle shirt. At that point, I only had a handful of posts up, and I don't feel like I really did the tutorial justice. So, now that it's summer again, and I'm feeling inspired by CTB Summer edition, I decided to add some updates to the tutorial. First, I'll start off with how to make a pattern from a shirt. Fold the shirt in half, inside out (I do this so I don't accidentally get marker on the outside) and lay it on your paper. As a side note, I use a roll of plain colored wrapping paper to make patterns. Much more economical than actual "pattern paper"
Trace around the sides, adding seam allowances to the shoulders and sides and mark the bottom of the neck where the ribbing meets the body. I also mark my pattern for where the bottom hem would be if I'm re-purposing a shirt and using an existing hem as well as add 1/2 inch for hemming for when I'm not using an existing hem. To finish drawing the shoulder and neck lines, hold the sleeve at the seam and trace. Do the same for the neck. Here's my finished pattern for the front. Cut out the pattern and lay it on top of the folded shirt to make any necessary adjustments. I ended up cutting a little off the shoulder and side seam allowance. Another side note, pattern weights help a lot when making patterns and cutting knits. And, you can make your own with my pattern weights tutorial. 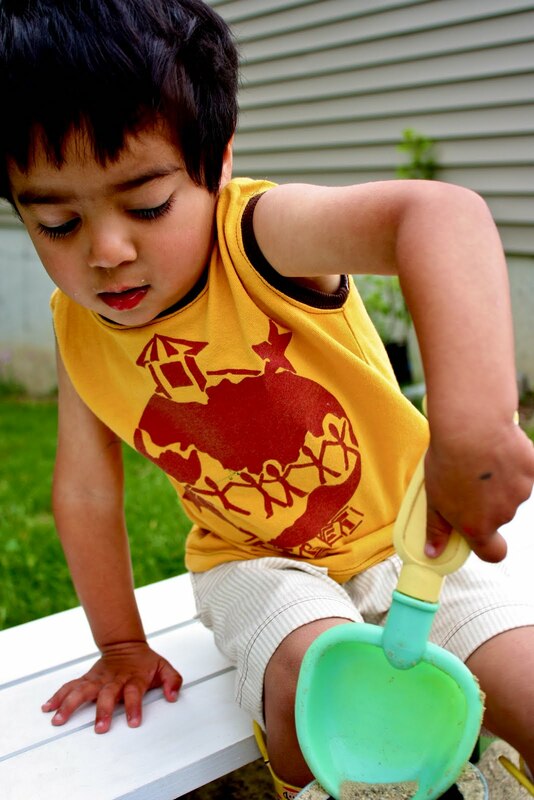 They also double as fun sewing rooms toys for little ones. OK, now on to the pattern for the back. First, trace your front pattern around all sides except the neck. Then lay your shirt on top and mark the neck where the shirt body and neck ribbing meet. Draw the neck curve the same way you did for the front. Cut out the pattern and make any adjustments. OK, now that we've got a pattern, we can make our shirt. My original tutorial has more detailed instructions, but I've added a little more detail about making the ribbing for finishing the armholes and neck here. 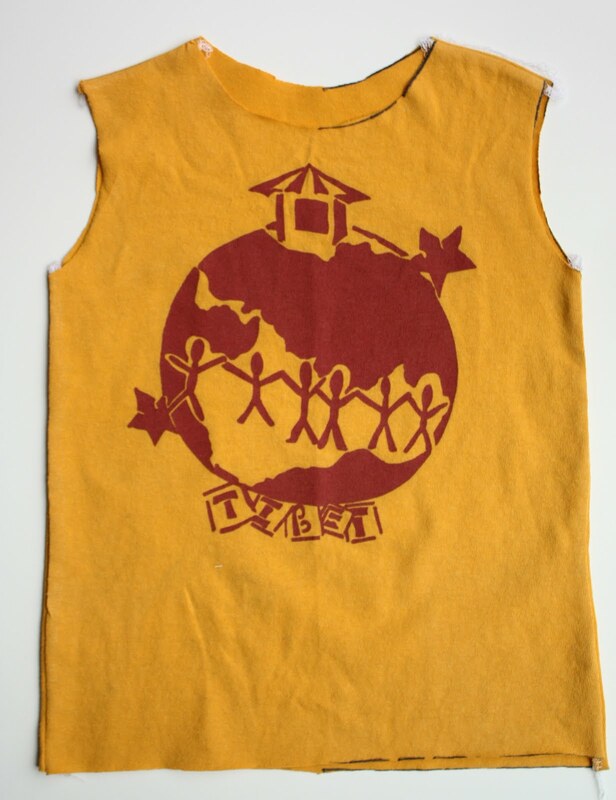 For this shirt I'm going to re-purpose a thrift store shirt from my stash, using the cute graphic on the front. Here are the front and back pieces I cut using my pattern. Sew side seams and shoulders with right sides together. Turn right side out and press. Next we will need to make ribbing bands to finish the openings. Measure the neck and armhole openings. We will be using strips of ribbing 1.5 inches wide and 1 inch shorter than the measured opening. So, my armholes were about 8 inches all the way around, so I cut 2, 7 x 1.5 inch strips. The neck was 14 inches all the way around so I cut another strip 13 x 1.5 inches. Next, fold the strips in half matching the longer sides and press well. Open up the folded strips, match the shorter sides, right sides together and sew with a 1/4 inch seam. I used my serger for all the seams, but you could also use a regular sewing machine. I would recommend using a longer stitch length than you would use on woven fabric or a wide zig zag. Fold the ribbing back up with the seam allowance on the inside. My original tutorial shows show to pin these ribbing bands to the shirt and sew in place. Basically, you match the raw edges on the ribbing with the raw edges on the armhole, pin and sew. Probably easier to understand when you see the pictures. 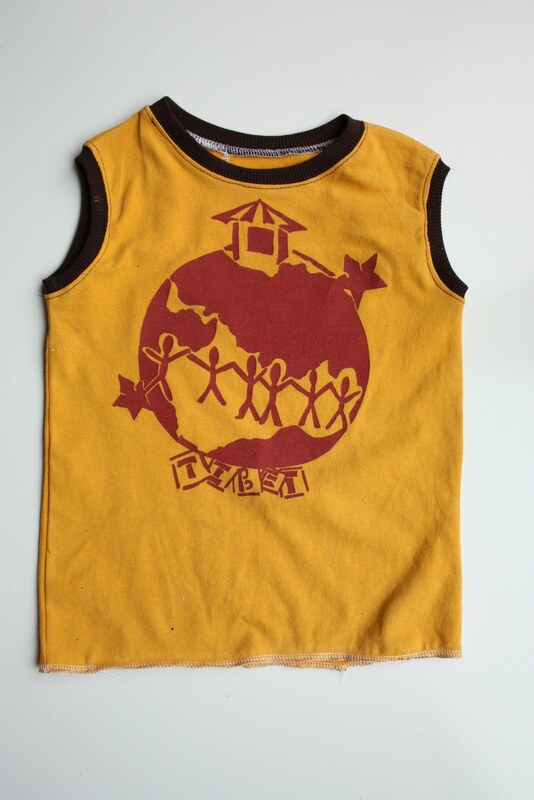 For this shirt I used my twin needle to sew a top-stitch along the neck and armholes. This is totally optional, but gives the shirt a more finished, store-bought look. It's helpful to iron your finished seams with a good amount of steam. It makes the fabric shrink up if it's been stretched and come together better. All that's left on this shirt is the hem. Since I wanted to use the graphic on the shirt I was upcycling, I couldn't use the existing hem. So, I serged around the bottom, then folded it up 1/2" and used my twin needles to sew it in place. Done! 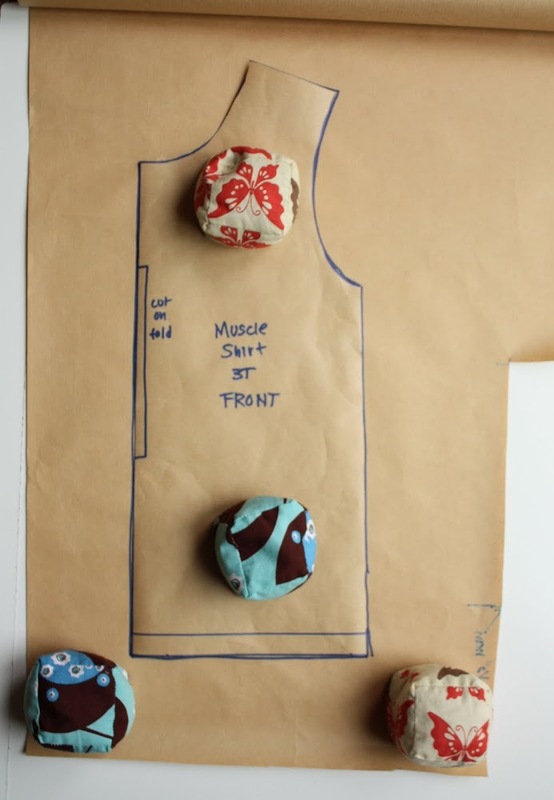 In the time it's taken me to write this post, I probably could have made 3 of these muscle shirts, they're that easy! Enjoy. Let me know what you think. There's a lot between the original tute and these additions.....hope it's not too much to digest. Do send me a link or pic if you make one, I'd love to see! thanks for the reminder to do some tank tops!! 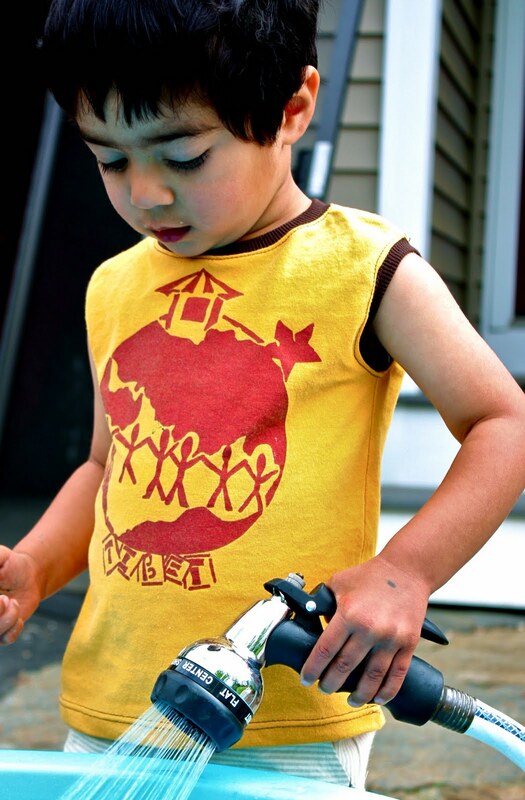 my son actually has quite a few shirts that still fit him from spring, but need an upgrade for the summer. those sleeves are coming off!